The low timbre of his voice shuddered down through Emma’s bones. There was something in it that frightened her. Something that reminded her of Mark’s eyes, distant and lonely. “Jules,” she said, surprised. He was hardly a mundane with the Sight, and as far as she knew, he didn’t know anyone who was. Muttering something like “never mind,” he spun her away, then pulled her back toward him. Years of practicing fighting together made them an almost perfect dancing team, she realized with surprise. They could predict each other’s movements, glide with each other’s bodies. She could tell which way Julian would step by the cadence of his breath and the faint tightening of his fingers around hers. Julian’s dark curls were wildly tousled; when he drew her near him, she could smell the clove spice of his cologne, the faint scent of paint underneath. The song ended. Emma looked up and over at the band; the clarinetist with the red hair was watching her and Julian. Unexpectedly, he winked. The band struck up again, this time a slower, softer number. Couples moved together as if magnetized, arms wrapping around necks, hands resting on hips, heads leaning together. Lady Midnight will be released on March 8, 2016! Click here to catch up on all the snippets that have been shared so far. Or a Clace wedding! I can’t wait!! I ship them so much! 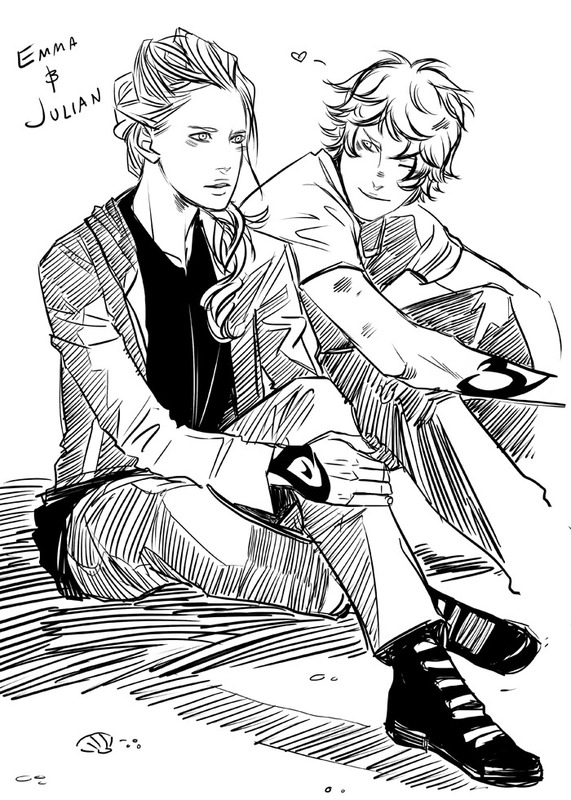 I started shipping them when I was reading City of Heavenly Fire. It’s so beautiful. And I can’t believe that Emma has a boyfriend! That’s not Jules! Jemma has already been added to my ultimate OTPs. The others are from TMI and TID. Cassie is such a great writer, especially on love and fantasy as a whole. The world she created is amazing!